Make It Handmade: Too Cute For Color TV! Too Cute For Color TV! But every now and again practicality flies out the window. When I thought my daughter was finally potty training, I set out to make her some cute underpants. It became an obsession. I bought yards and yards of knit in pink. I tried a few free patterns, but I couldn't get something that had the full coverage that preschoolers need. Finally, I begged the wonderful Bonnie of Fishsticks Designs to let me try out her adorable Little Fishies Undies design. I ended up with some underwear that are just too cute for color tv! I know the sewing isn't perfect, but my daughter loves them (because they are pink, of course). I made a few changes to the pattern (using ribbing and a single layer of knit). They are stretchy and comfy enough to be worn right on top of her diaper. Yep... that's right. Even after all the enthusiasm, we are still in diapers. BTW-- I can't say enough good things about the Fishsticks patterns-- the tutorials are so clear, and she gives instructions on how to use the pattern to make training pants. (which is what I'll be doing, since potty training was a flop.) She also has a neat 'select a size option' which allows you only to print the sizes that you need on your pdf! Basically, she does everything short of actually sewing it together, and actually potty training your child. I was planning to make a bunch of these, but Ill think I"ll wait just a bit. The sizes run up to age 12, so hopefully we'll be out of diapers by then. Looking for some cute knit to make your own undies? Our sponsor Rasbperry Creek has Heather Ross pattern knits for less than $10 a yard. 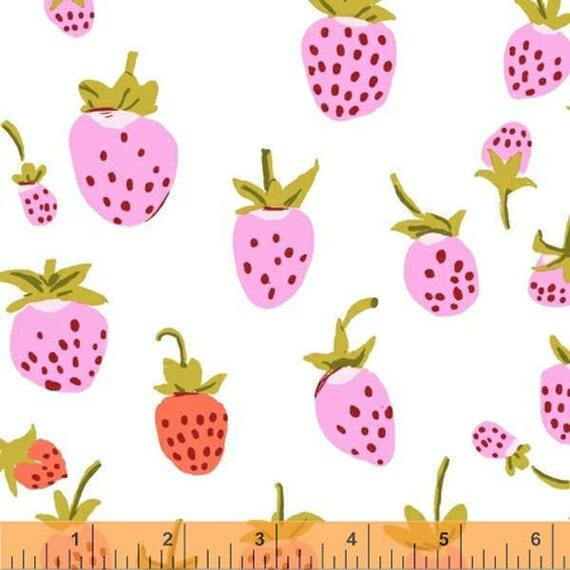 These berries would be so adorable in this pattern!